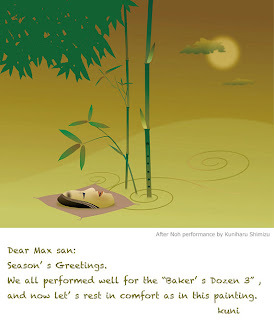 Maxenne san: I tried to send this greeting via email but it kept on coming back. I thought about sending it via postmail, but decided to post it on this blog so many people wlll know there is a splended editor, to whom i am thankful. Thank you for all you have done to publish "Baker's Dozen 3".